Do you know the signs of being over stressed? There are many, but recognizing stress is pretty straightforward. Overeating, drinking, habitual difficulty sleeping, irritability, feeling anxious and even avoiding work are all stress related behaviors. A recent survey conducted by the American Psychological Association reports that 83% of Americans feel that their stress levels have remained the same or increased. So why do so many people report having such high levels of stress and what can be done about it? First of all we must understand what stress is before we can attempt to deal with it. Contrary to popular opinion, stress is a normal response to adversity in humans (and animals). Its purpose is to cause us to focus on a situation that requires our attention. If you are a rabbit in the woods and see a fox coming, you will feel stress! You will also take immediate action without “thinking” that just might prevent you from becoming lunch. Of course, in the case of people stress will cause us to overreact in many situations as well as to “over think” at those times when we should be relaxing or involved with other activities. 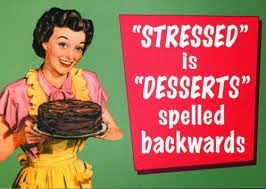 The secret to overcoming the effects of stress lie in developing the proper coping skills. Most stress is caused by commitments that we have and the expectations that others place upon us and learning to change the way that we think about these things is the key to handling stress properly. It’s all about positive thinking and not dwelling on what has not yet occurred. How many times have you been watching your favorite TV program and caught yourself thinking about what you must do the next day? This is an example of creating stress in our own minds. Learning to control your thoughts and to enjoy the moment is a coping skill that you must develop in order to control your stress level. Research has shown that people that learn this skill greatly increase control of their emotions and become almost 40% more productive! It’s all about the way we think. We’ve all met that person that’s always calm and seems in control no matter what, right? Did you ever notice that everything seems to go smooth for them and they never seem to have a problem in the world? Well, they do have problems but the difference is the way that they handle the situation. If you want to be like this person (every office has one!) than you must learn the following rules for dealing with stress. Realize that stress is normal and that actually eliminating it is not possible. It’s how we deal with it that makes the difference. As mentioned earlier in this blog, control your thoughts and you will control your mood. Take a close look at the things in your life that cause you the most stress and try to find a way to deal with them more effectively. A lot of these situations are within your control. Hate traffic? – Leave earlier (or later)! No time to cook dinner on workdays? – Cook extra and freeze it for another time or plan to buy dinner instead. Perhaps someone else could help as well. The point is to try to avoid stressful situations if possible. It’s important that you understand that stress is controllable. While we cannot determine much of what happens to us during the course of a day, we can control how we allow it to affect us. Learning to manage stress takes time but anyone with the will can do it to improve their lives, health and happiness.